Grady won't miss his reality show of birds, mice and butterflies on CD. He's absolutely transfixed by the action. 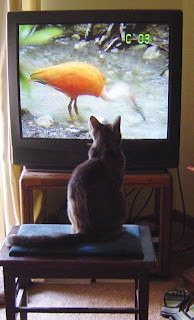 He can't quite figure out how they got into the TV even though he tries fishing them out from the back and top of the set.